Archbishop Desmond Tutu is no stranger to controversy. From racism and social injustice, to the threat of AIDS, the continuing crisis in the Middle East and the importance today of 'ubuntu' (the concept of shared humanity), the Archbishop expresses his views powerfully and honestly, showing how faith and politics are inextricably linked. A forceful opponent of apartheid and later a compelling leader of the South African Truth and Reconciliation Commission, he was awarded the Nobel Peace Prize in 1984 and has remained a leading campaigner for human rights ever since. In 2009, he was awarded the highest civilian award in the United States, the Presidential Medal, by Barack Obama. This collection brings together some of the Archbishop's key speeches, sermons, lectures and exchanges from the past three decades, charting the trajectory of his extraordinary career and showing why he remains one of the world's best-loved and most outspoken religious figures. 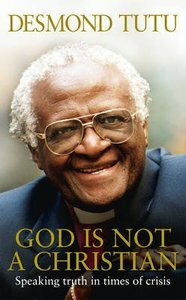 Edited by John Allen, a journalist and former aide of the Archbishop, God is Not a Christian reveals Archbishop Desmond Tutu in his own words. About "God is Not a Christian"